Fellow pontist James Baughn of bridgehunter.com found a real diamond in the rough most recently while on tour through Illinois, but one that is really fragile and could splinter if nothing is done to preserve it. The diamond in the rough is this bridge. The structure is located at Cypress Pond State Natural Area. 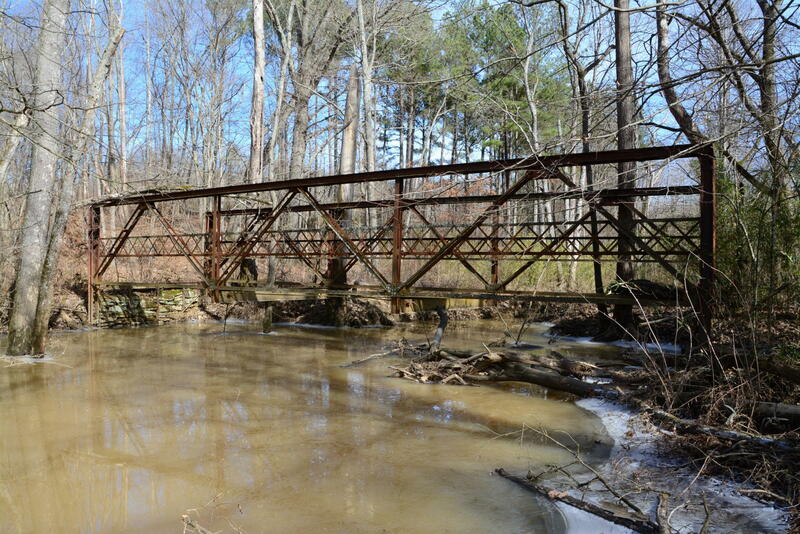 The bridge spans the old channel of the Cache River along what is left of a road connecting Elvira and Pleasant Grove, approximately five miles west of the nearest town of Buncombe. The road has been abandoned for decades and the only way to access it is by walking about two miles south from where Baldwin Lane ends on the northern side of the crossing. The southern side is not accessible due to corn fields and the impossibility to cross the new channel of the Cache River. Yet when arriving at the bridge, the hike is well worth it as the bridge has features that are atypical for truss bridges. At 50 feet long, the bridge is a bedstead pony truss bridge with a Warren design. Bedstead trusses are characterized by endposts that are vertical, forming a 90° angle. Because the connections are riveted, the build date has to be somewhere after 1900. The reason for this is because riveted truss bridges made their debut at the turn of the century to replace the pin-connected truss spans because they are able to withstand increasing volumes of traffic. They were standardized by the states through different laws and regulations by 1915, narrowing the different trusses down to half a dozen and phasing out all other truss designs and the use of pinned connections altogether. The railings feature a lattice design that is inside the trusses, bolted together. This is unusual for truss bridges of its design and age, for only simple railings were used after 1900. One has to assume that this bridge was built at this location between 1900 and 1910. It is unknown who built the bridge, let alone when the structure was abandoned. For the latter question, it may have happened at the time when the Cache River was rechanneled, which we don’t know when it happened. The problem is the bridge is falling apart due to nature’s wrath. In other words, if nothing is done to relocate it and restore it in due time, the bridge will surely collapse into the river. 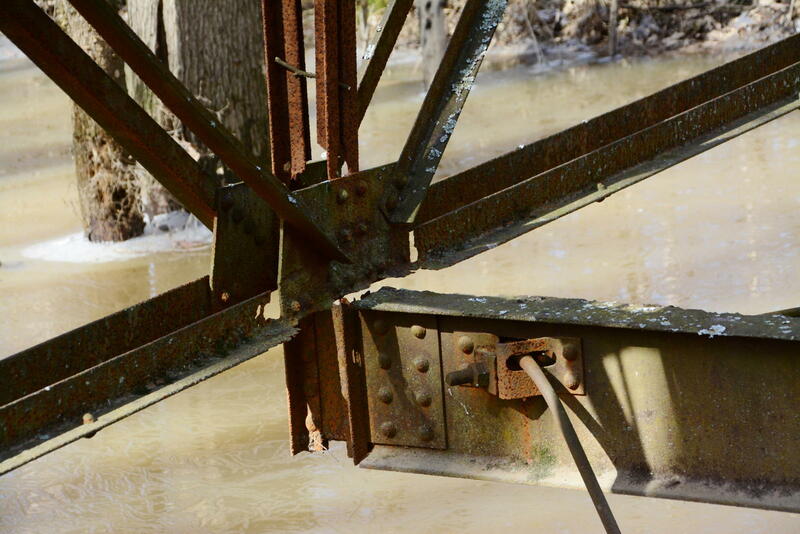 Problems that James Baughn saw during his field visit included the fact that the bridge has no decking left but just the bottom chord that is hanging by a thread over the river. The entire bottom chord has corroded away to a point where it and the trusses themselves could fall into the river. The support is pretty much gone. Furthermore, the northern endposts have sustained damage in a form of twisted and corroded beams. This was caused by a shift in the river current, combined with erosion and other elements. In addition to the damage on the north side, a tree is growing right through the chords, thus causing damage to the stringers. On the south end, it is not much better as erosion was dominant and undermining the abutments to a point where they could fall into the river upon the next flood, along with the trusses themselves. To make it short, time is of the essence to pull the bridge out and find ways to reuse it. Potential for restoring the bridge is possible but it would require extensive work with sandblasting and replacing the beams. 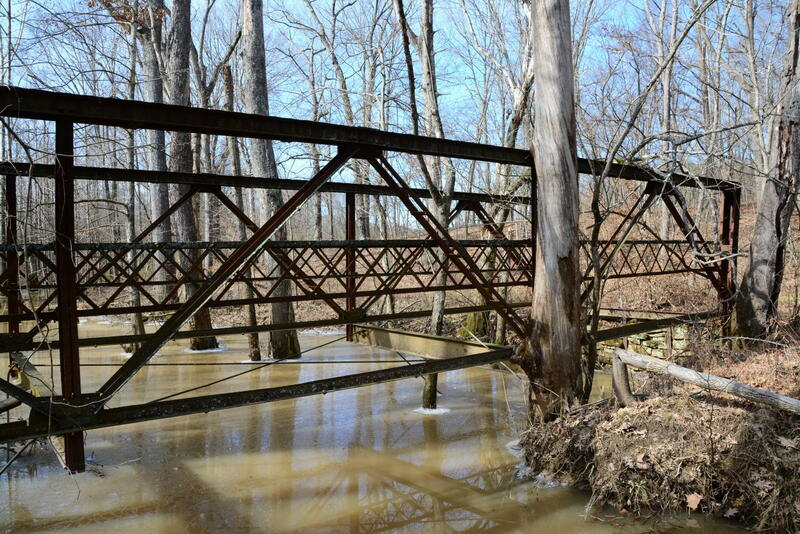 Ideas on how to approach this delicate project should be referred to the county officials in Johnson County as well as some of the bridge companies that are experts in bridge restoration, like Workin Bridges and BACH Steel, as well as Mead and Hunt. Even if the flooring system is not salvageable, which appears is not the case, the trusses could be used as ornamental railings for a new bridge. But as mentioned before, time is of the essence, as well as the interest. When there is a will to save this bridge, there will be a way, especially as it has a lot of history to be looked at in connection with the Cache River and the county itself. 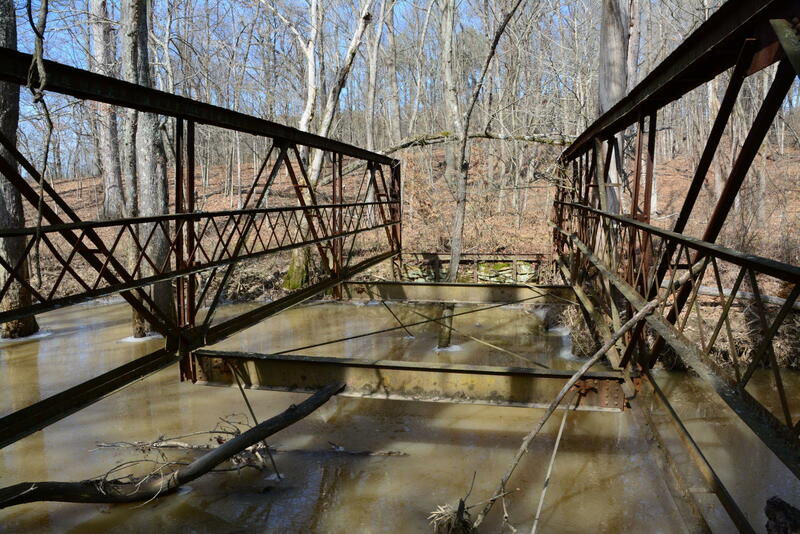 Check out James Baughn’s page with some more info and photos he took of the bridge here. ERLA-CRANDORF (SAXONY); GERMANY- Not far from the towns of Markersbach and Schwarzenberg is our next mystery bridge. This one is located over the Schwarzwasser River in the small town of Erla. First mentioned in the history books in 1308, Erla and its neighboring village Crandorf are located three kilometers southwest of Schwarzenberg. Combined, they have a population of only 2000 inhabitants, with Erla having 850. The two communities had been a joint entity from 1925 until it became part of the Schwarzenberg consortium in 1999, which remains to this day. While Crandorf is located on top of one of the mountains in the Erzgebirge, Erla is wedged deep in the Schwarzwasser Valley and is easily accessible by rail and by highway, both leading to Johanngeorgenstadt, which is at the border between Germany and the Czech Republic. This bridge is one of the most unusual through trusses one can visit. It is located 50 meters from the train station and right next to the steelworks, which has existed as long as the community. When looking at the bridge from a distance, it appears a duo span that are siamese twins, meaning one truss bridge is connected to a larger truss span. Upon further view, the bridges are indeed separate, but the spans are different in size and age. The only similarity is that they are both Warren trusses with subdivided vertical beams, yet the larger one has a Scharper design. The larger span features a through truss span with a 45° skewed portal bracings, which stretches three panels on the right side of the truss. Both the portal and the strut bracings are I-beamed shaped, while the first left panel has a vertical bedstead endpost and 60° heel bracings supporting the first strut and the portal bracings. All beams are mainly I-beam, with the vertical beams being H-beam. All connections are riveted. Every panel has a heel bracing on the bottom end of the decking. The bridge is 25-30 meters long and about 10 meters wide. It is taller than the neighboring pony truss bridge by 2 meters. The bridge is much newer with the only engraving being the name of the steelworks company, the Friedrichshutte, based in Laubach (Hesse), which is east of Frankfurt (Main). It is very likely that the bridge was built after German Reunification and is between 10 and 20 years old. But when it was built is unknown. It is just as unknown as the pony truss span located right next to it. The bridge is definitely older, yet the question is how old. The Schwarzenberg-Johanngeorgenstadt-Karlsbad route was built in 1883, and the railroad was rerouted between Erla and Schwarzenberg in 1946, which included the elimination of the tunnel going underneath the castle in Schwarzenberg. 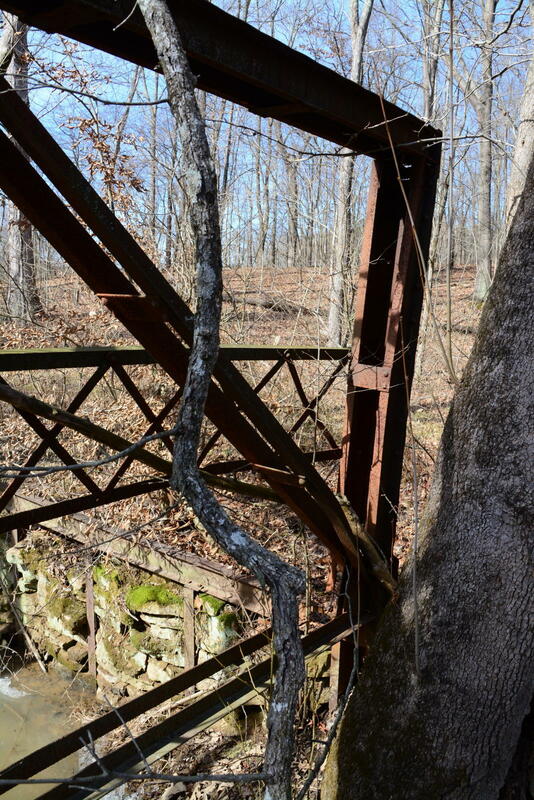 The chances of the pony truss span being built during Communist times is likely as riveted and welded trusses began to take over trusses with pinned connections in 1910. Bridges built to replace those destroyed during World War II were built using this type of connections on the trusses. This pony truss bridge has welded connections as it was built using T-beams. Even the gusset plates are welded into the beams making it sturdier. What is unique about the pony truss span is its unusual skewed span. It appears that the skew is 60°+ or misaligned by four panels, which makes it unusual for a skewed truss span. The vertical beams feature a pencil-like thin trapezoidal design, where the beam’s width is 25 cm, yet the beams narrow to form a pencil chewed on both ends- with 40 cm from the top and 25 cm from the bottom chord. The truss is 2 meters tall and the width is about eight meters. Because of its age and narrowness, it was subsequentially replaced but never removed. Even though it has been fenced off, it appears that a bike or pedestrian trail may be in the works in the long term, especially as there is a bike trail already in existence between Aue and Schwarzenberg. If it is the case, it may be an advantage for those wishing to bike up the mountains. A photo gallery of the two bridges is below. If you know more about the bridges, feel free to contact the Chronicles. The main questions to be answered are: What more do we know about the history of the bridges? What did they look like before 1945? When were the two bridges built? And in the case of the pony truss bridge, who was the bridge builder? Any ideas and help would be much appreciated. One-of-a-kind bridge replaces a two-span bowstring arch bridge and re-establishes connection in small village in Saxony. LUNZENAU/ GLAUCHAU- During my bike tour along the Zwickauer Mulde this year, I was greeted with new bridges that had replaced structures that were, on the one hand, damaged by flooding, but on the other hand, appeared bland and needed a makeover. After the Wernsdorf Wave near Glauchau, another bridge is making its debut, but one that restores a key connection in a small community that is nestled in a deep river valley and provides various recreational possibilities. Enter the Lunzenau Pedestrian Bridge, also known to locals as Küblers Bridge. This bridge is located on the north end of the town of Luzenau, just off the Mulde Bike Trail, located at Schaisdorfer Flur near Eichelberg. Biking past the bridge back in March, the bridge was already installed in place and in the final stages of completion, which included constructing the approaches and adding lighting to the deck. Since 22 June, the bridge is now in use for pedestrians and cyclists, thus restoring a vital connection between Friedrichstraße where a couple factories had once stood, and Burgstädter Straße and the park and sports complex on the opposite end. The two-span, 75 meter bridge replaced a two-span bowstring through arch bridge that was built in 1889 and was christened the “Augustus-Johanna-Brücke,” named after the royal couple in Saxony at that time. The bridge was dedicated on 13 July that year and provided access to the factories located at Schaisdorfer Flur, where Friedrichstraße is now located. The structure had a Parker truss design with pinned and welded connections. The endposts were vertical- a rarity for bowstring Parker designs. The portal bracings consisted of a beam bent into a trapezoidal fashion, yet the struts have straight beams with 50° heel bracings. Despite being rehabilitated in the 1950s, the bridge had maintained its original form and continued use until it was damaged by floodwaters in 2013 and subsequentially condemned in December 2014. After securing funding for the project in May 2015, the contract was given in December that same year and in January, the project began with the removal of the truss spans with the crane and the demolition of the eastern approach spans and abutments. This was followed by rehabilitating the center pier and adding a new concrete foundation at the top to anchor the new spans at the center. The new approaches and abutments were built at the same time. In January of this year, the new spans were brought in by truck and installed with the crane. During my visit in March, the roadway had already been installed, as workers took advantage of the unseasonably warm weather and tried finishing ahead of schedule. Close-up of the V-shaped towers and restored stone pier. In terms of the bridge’s appearance, the structure, painted in red (trusses), white (railings) and blue (tower), is a real eye-opener that will surely become one of the town’s key landmarks. The bridge is a cantilever pony truss bridge, designed as a Warren truss, but having one tower, planted in the middle of the river, supporting the two spans that each extend to the abutments on the river bank. Its tower is V-shaped, extending outwards. The bridge had welded connections as the tubular steel beams were assembled together at the bridge-building firm before being carried to the bridge site by truck and put together by cranes. The bridge’s design follows the examples of two bridges: the towers mimic those of the three cable-stayed bridges being installed in New York City; the cantilever truss follows closely to the Paradiesbrücke, a more ornamental but almost 120-year old structure that spans the same river but located upstream in Zwickau. With the Lunzenau Bridge in service, we have two one-tower cantilever Warren truss bridges along the Zwickauer Mulde- a rarity in Europe and even North America- but the newer bridge is sleak and really colorful, an attraction that will get many bikers and pedestrians to stop by to pay a visit. The dedication ceremony was met with very positive feedback as dozens gathered to cross this new bridge. This included members from the construction company that built the bridge, from the District Mittelsachsen, Mayor Ronny Hofmann and even Pastor Gerd Flessing who oversees the local church. “Without the funding, careful planning and participation of everyone in this project, this project would never have been realized,” said Hofmann in an interview with the Chemnitz Free Press. “This bridge is a real jewel and I’m thankful everyone had a chance to be involved in this.” That comment is completely true in that aspect. Those who chimed in on the structure got themselves a real gem that will be up for many awards for its design. The bridge will indeed gain from all who have seen it and recommended it to others. Check out the town’s website, which has some details on its bridge and history. Our 79th Mystery Bridge takes us to Oklahoma; specifically to Whitesboro in LeFlore County and this bridge. Spanning the Kiamichi River at Township Rd. 4044C south of Whitesboro, this bridge is one of the most unusual through truss bridges a person will ever see in the United States. According to the data from Bridgehunter.com, the total length of the bridge was 270 feet with the largest span being 127 feet, the width of the bridge is around 13-14 feet and the vertical clearance is 13.3 feet. Yet despite the date of construction being ca. 1940, this bridge is unusual as it is a pinned connected through truss, thus bucking the standards of truss bridge construction. As many resources have indicated, most truss bridges built at this time had riveted or welded connections, making the structure sturdier and able to carry heavier loads. Pinned connections had a tendency of dislocating or even having the bolts connecting the beams to break off, causing bridge failure. This resulted in many of the structures being taken off the state highway system and relocated onto less-used township roads beginning in the 1920s and extending well into the 1950s, especially as the US was lacking materials and engineers as a result of World War II. Judging by the appearance of the bridge, it appears to have been built between 1910 and 1915 as this was the cut-off period for constructing truss bridges with pinned connections. It was congruent to the time standardized bridges were approved by the state governments, which included not just focusing on truss bridges with riveted connections and either Howe lattice or lettered portal bracings (namely, A, X, M and West Virginia framed), but also the key truss designs, which were the Pratt, Parker, K-truss, Warren, Polygonal Warren and in some cases, Pennsylvania petit. The Whitesboro Bridge features a Warren through truss, but looking at the structure further, it appeared that in its former life, it was a deck truss bridge that had many spans, totaling at least 500-600 feet. One can see how the overhead bracings were added, which consisted of thin cylindrical steel beams. Furthermore, there is no portal bracing, like other truss bridges, and lastly, when looking at the joint where the upper beam and the diagonal end posts meet, the upper beam appears to have been sawed off. According to observation by fellow pontist, Mark W. Brown, the piers are 2-3 feet wider on each side and 1-2 feet higher, thus creating a slight slope when entering and crossing the structure. Two theories go along with the piers: either they were installed when the bridge was built or they were reinforced after the bridge sustained structural damage because of flooding. It is possible that this crossing was the first to have been built as the town expanded because of the baby boomer population. But the expansion did not last as many people moved to bigger cities for job opportunities. As of the 2008 Census, the population of the town incorporated in 1908 and named after one of the founders is only 1298. The hunch is that the highest population of Whitesboro was about 3,400 by 1960. The Whitesboro Bridge has a design that is not like any unusual designs developed by the engineers at all. 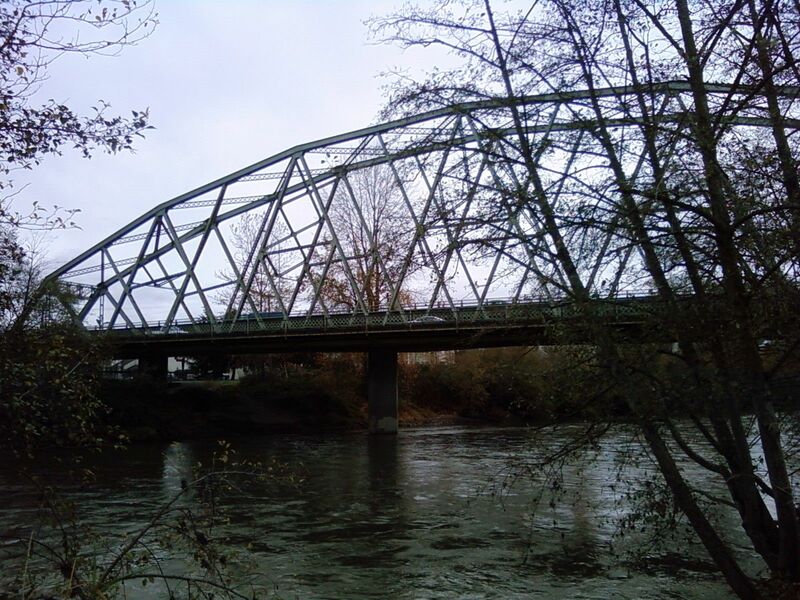 It is neither a Pegram nor a Kellogg, now is it a Schaper truss, which you can see in many truss bridges built in Germany and other parts of Europe. This bridge is definitely a repurposed truss bridge, having gone from its previous life as a deck truss spanning one of the state’s greatest rivers, like the Red and the Canadian, to one spanning a smaller river but on whose width justified a through truss span. When exactly was this bridge built and was there a previous structure? Who was the mastermind behind this repurposing project and why did the engineer choose this? Where did the bridge originate from? When was this built and who was the bridge builder? Are there other remnants of that bridge left besides the one at Whitesboro? What do we know about Whitesboro aside the facts and figures presented in wikipedia? Got any leads, please share in the comment sections here as well as in the Chronicles’ facebook pages. You can also contact Jason Smith at the Chronicles, using the link here. As this bridge is eligible for the National Register of Historic Places, any information you have or can find will help build a solid case for its nomination, let alone preserving it for future generations. As Oklahoma is losing historic bridges in large quantities in the past 8 years, the time is ripe to preserve what’s left of its culture, especially when it comes to unusual designs like this bridge in Whitesboro. Special thanks to Mark W. Brown for bringing this to the author’s attention and for providing some interesting pics of this bridge. 500-year old covered bridge will receive a much-needed, total makeover next year. ZWICKAU, GERMANY- It is one of two prized structures spanning the Mulde River that deserves international recognition. However, it is not only the oldest bridge in Zwickau, but the only known bridge of its kind on the globe. The Röhrensteg was built in 1535 and rebuilt to its current form in 1790 after sustaining damage in a flood. The bridge is the only structure in the world that carries two different truss designs- a Queenpost on one side, and a subdivided Warren on the other. It has two different portal bracings: the A-frame on the city end, and an X-frame on the end going to Reinsdorf. The endposts are unlike any covered bridge known to people Europe or North America. The covered bridge is the only one of its kind that carried water across the river into the city, via wooden pipes coming from a reservoir in Reinsdorf, 4 kilometers east of Zwickau. The bridge has survived the test of time, including wars, weather extremities (including flooding) and the increase of traffic with bikes and pedestrians. And the age has shown on this structure, as shingles are missing on the bridge’s hip roofing, wood siding is becoming dilapidated, the flooding deteriorating, and some truss beams are deteriorating because of the growth of moss and development of cracks. Yet because of its unusual design and historic significance, the City of Zwickau, together with an engineering firm in Chemnitz, are working together to restore the bridge. According to the Chemnitz Free Press, the list of what to do with the historic bridge is long: new roofing is needed, along with the siding; new beams and flooring are a must; the strengthening of the structure itself so it can last another couple of centuries is unavoidable, and lastly, the restoration must be done in-kind. That means, restoration must be kept in a way of its original form, using acorn planks. The cost for the project, according to the city council is an estimated 400,000 Euros (ca. $510,000). However, the project has been approved because of the bridge’s association with Zwickau’s history and heritage, in addition to the wishes of the residents to keep this bridge. The lone catch behind this in funding. According to Thomas Pühn, director of the City Planners Office in Zwickau, the city is applying for state funding to cover the costs for the project. If approved by the state legislature in Dresden, the city will only have to cover 10% of the cost, with 90% coming from the state. The decision lies with the State Department of Transportation and Infrastructure in Saxony (German: Landesamt für Straßenbau und Verkehr). When all is a go, construction can proceed next year, yet it is unclear how long the restoration will last. 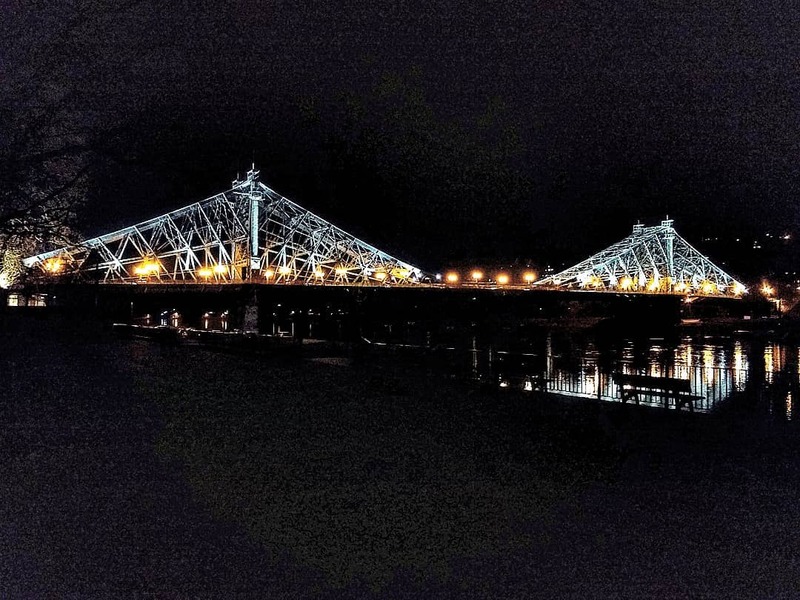 In either case, the city and people associated with the bridge are doing everything possible to make sure this bridge will continue to serve traffic while reminding others of its significant role with the history of Zwickau and Saxony’s infrastructure. The Bridgehunter’s Chronicles will keep you posted on the lastest on the project Röhrensteg. The bridge has already been nominated for the 2016 Ammann Awards for Best Kept Secret Individual Bridge and Bridge of the Year. Whether or not it wins depends on the voting when it commences in December. Together with neighboring Glauchau and a couple other cities in Saxony, Zwickau is also nominated for the Tour Guide Award.